Apple retail stores are selling bike helmets now that pair with Apple Watch. You had saw apple selling Apple Watch, iMac, iPhone accessories but not this . they are selling this with Apple watch. One of the highlights is that Apple Watch can detect when you’re making a hand movement to signal other cars or bikers around you. When you make the movement, the helmet turns on it’s lights to signal which direction you are going. 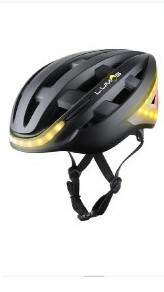 Lumos is a connected bike helmet outfitted with controllable lights for added safety and signaling. Situated on the rear of the helmet, its array of 38 LEDs can light up to form a red triangle or white turn signal as additional visibility on top of traditional front and rear bike lights. The helmet was recently updated with two compelling new features centered around the Apple Watch. The first is the ability for the watch to discern your hand signals while riding, automatically illuminating the helmet’s turn signals when you do so. The second is convenient for those looking to track their workouts and daily activities: Whenever the helmet is switched on, it will automatically start recording your activity through Apple Health. Hax has partnerships with a variety of retailers including Target, Best Buy, and Apple, and participating startups are given the chance to pitch to and collaborate with these potential customers to bring their products to market. As part of the program, Lumos’ co-founder Eu-wen Ding was able to pitch the Apple retail team, which raised an interesting possibility—that Lumos, a bike helmet, could be sold by Apple. However, in order for a third-party product to be considered for availability in Apple Stores, it needs to integrate with Apple products in an interesting way. While the helmet already worked with an iOS app for its battery notifications, the team needed something more novel. They brainstormed, and the Apple Watch idea “stood out as a killer feature,” Ding says. Most Apple Watch applications either augment or offer a minimized version of a smartphone app. It’s rare to see the watch used as a controller outside of the occasional Apple TV game. The Lumos team worked on the feature for seven months, with the Apple retail team available for feedback during the process. The helmet sells for $180 and just went on sale at Apple Stores. The Apple Watch app also allows the for rides to be tracked and synced with Apple’s Health app and Strava. Thanks for reading! what do you think about this product? Tell your thoughts about lumos helmet and comment down below!